How to Build Your Own! Like any project, first do your research. There are many other interesting trebuchet sites on the Internet. Use a simulator. Go to this site for a good one. Make a plan and draw it up. Keep it simple; something simple and within the guidelines. Use the data from the simulator to have an idea of how to build it. A low braced triangular design was chosen for this example. 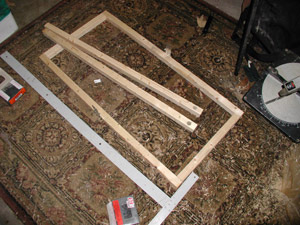 Install the up-right supports and angled support braces. Build and install the throwing arm (a lever). Add the ballast bucket (a counterweight). Add the trigger and trigger adjustment chain. Build a base and side supports. If it starts out square, it is more likely to stay square, so pay attention. Measure, cut, and lay out 2x2 base parts. Apply wood glue and screw together. Attach a chain to the throwing arm. The ballast bucket (kitty litter container with rocks in it) will be attached to the chain (so it can swing freely). The chain is anchored by a screw through a washer into both 2x2's. Route or chisel out a small channel to accommodate the chain and washer before screwing the three 2x2's together. Note the original wooden dowel "cross bar" which was later replaced with a metal tube (conduit). The cross bar is the pivot point or fulcrum between the counterweight and the far tip of the throwing arm. Reduce the friction where the crossbar goes through the supports by using graphite lubricant or better yet, roller bearings. Also note the original drawn plan the arm is lying on. 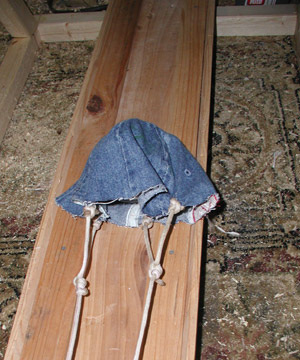 The wooden towel rack dowel first used for the pivot was too weak to handle the load of a half a bucket of swinging rocks. A length of metal conduit was substituted. It has greater strength. There is a screw going through the 2x2 and into a hole drilled in the metal conduit so the arm must move when the pivot rod moves. The throwing arm should be light but sturdy. If the arm is heavy you will use energy moving the arm that could be used in throwing the ball. Install the shot trough and attach the ballast bucket to the throwing arm chain. When the bucket of rocks drops, the throwing arm rotates and the sling throws the croquet ball. Note the wooden end-caps on the metal conduit outside of the support arms, they add lateral stability. Note in the background the custom "double handled" kitty litter bucket. The handle of the attached bucket is bending, so it was replaced with a bucket that had an extra handle added to it. 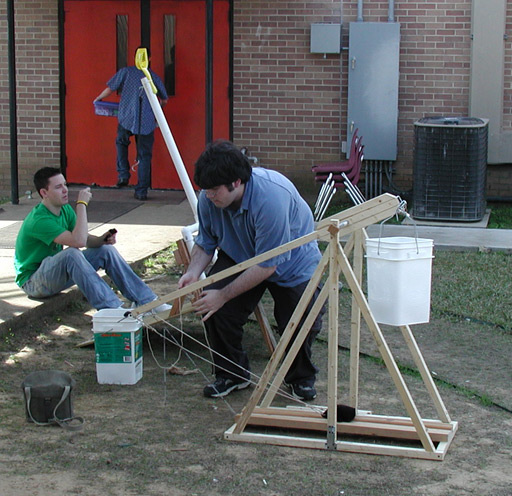 Note the croquet balls this trebuchet was designed to toss. Several rocks were added to the bucket as ballast. As they did in medieval times, you can use a carefully bent coat hanger for the trigger. The bend in the base of the hook (where it goes into the trigger adjustment chain) is important. That slight offset allows the trigger to catch and stay on the release eye bolt. When the string is pulled, the trigger rotates around the hook and disengages from the eye bolt. This is a safe, reliable, and easy to fire trigger. It uses a fulcrum and an offset "center of tension" for mechanical advantage. 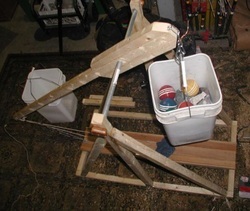 The small trigger string can be pulled from a safe distance away from the trebuchet. There is a length of chain attached to the back of base unit. It was marked in 10 centimeter increments. The trigger hook location on the chain is adjustable. Moving the trigger closer to the catapult causes the arm to cover a greater distance; which in turn throws the ball farther. Moving the trigger further away from the base uses less arm swing, and therefore throws the ball a shorter distance. The calibration chart below shows where the trigger hook should be placed on the trigger adjustment chain in order to throw the ball a known distance. Add the sling/shot-pocket assembly. At first, the top cut out of a "Gimme" cap was used for the shot pocket.This did not work well. The design was altered to use a square piece of leather for the shot pocket. 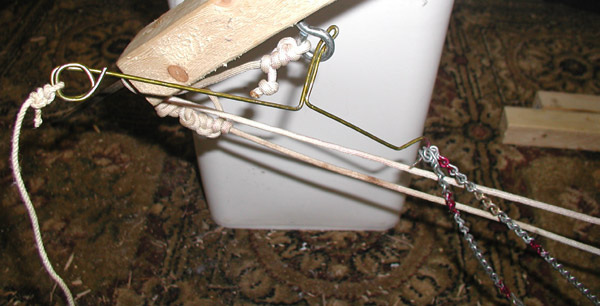 Note the four attachment points of the string (like a Y). With just two strings to one cloth or leather patch, it is like balancing a ball on a knife blade... difficult. If you bifurcate (split like a "Y") the line to have two attachment points on each side, it makes a natural pocket in the middle. The shot trough keeps things from getting tangled up and assures a straighter throw. There are raised wooden strips on each side of the flat shot board to keep the ball centered and in-the-groove. Find out how too few ballast rock affects the throw. Sling would not let go of the ball which caused it to hit the dirt right just in front of the catapult. Add more rocks. Find out how too many rocks can damage the ballast bucket handle. Make double handled kitty litter buckets to deal better with the stresses. More rocks for ballast make for further throws, but you can also destroy the machine quicker. Find a sustainable balance; too many rocks in the ballast bucket does not throw well, too few rocks does not throw well, it must be "tuned" for what you are throwing. The same thought applies for the sling ropes, they can't be too long or too short but must be "just right" for it to work. You will need to experiment. Make sure the rope lengths are even and knots are secure. Line length is critical, when the arm is vertical, the shot pocket should be just above the cross bar. Having the release string and the "static" string affixed to the same location (throwing rod in tip of throwing arm) is critical for accurate repeatable throws. Instructions and images taken from wikihow.com.